Tomorrow is the first day of September. If I had to rank my favorite months, September would be in the top 3. December is my favorite, October is getting closer each year to that top spot, and September just screams hope for fall weather. It also happens to be the month to teach little kids about apples, trees, and Johnny Appleseed. As a teacher, I still decorate in the stereotypical apple decor and I probably won’t change that. I usually have an apple smelling candle going daily in the room. I make red hot apple sauce for the kids to taste. I may even make some apple tarts this year. I could swing it, if I start planning now. School is off to a better start than I was expecting. We are now settled into routines and the personalities are HILARIOUS. I have really enjoyed getting to know my little ones and sharing my favorite stories that quickly become theirs. It took a few days to get things calmed down, though. I really let my job take over my life for the past two weeks. I would come home…exhausted…and either fall face first on the bed or catnap on the couch before struggling to get in some miles and food. And the food choices were not that great. It was graze on whatever was in the fridge or just not eat. I wanted soup. The kind of soup I make when I’m sick. Or it’s 20* outside. The kind of soup that just makes everything seem better. 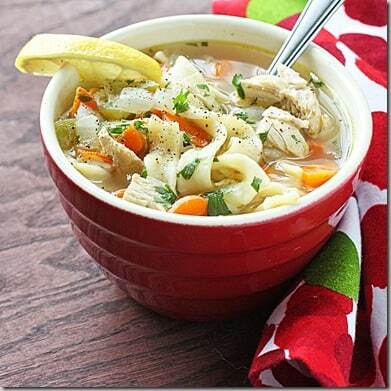 Chicken Noodle that Campbells wish it could can. salt, pepper, poultry seasoning, chicken bullion if desired. 1. Sautee’ veggies in stock pot with 2 T oil or butter. Cook about 8-9 minutes until onions are done. 2. Add chicken and seasonings and stir with veggies. 3. Add liquid to completely cover chicken and vegetables. 4. Add noodles. Turn heat to low and let noodles cook about 10 minutes. Garnish with parsley and fresh lemon. I keep hearing rumors about fall. I see the leaves. I feel the mornings changing to cooler drier air. I know the squirrels are chasing each other for winter food. It won’t be much longer until the 90’s are a thing of the past. 4 more days….ROLL TIDE ROLL!!! first day of september..leaves are gonna start fallin soon..n dat nostalgic air o’fall will start blowin’..a very nice n easy recipe! !..will surely try it.